Product prices and availability are accurate as of 2019-04-05 03:59:57 EDT and are subject to change. Any price and availability information displayed on http://www.amazon.com/ at the time of purchase will apply to the purchase of this product. "Bumboodle" soft and gentle baby wipes are made from annually renewable bamboo fiber, contain moisturizers, Aloe, Chamomile and Vit E. Gentle for baby's delicate areas. Kind to the planet. 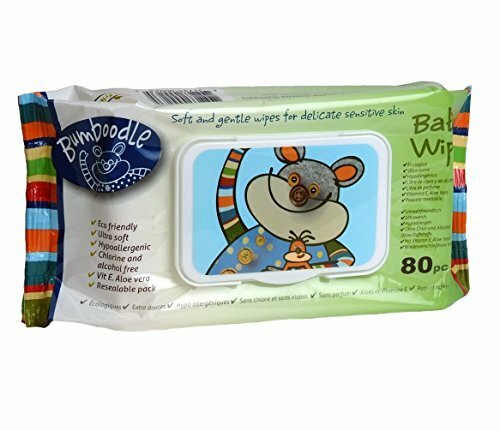 Naturally antibacterial bamboo wipes. Hypo-allergenic. Naturally deodorizing. Soft, silky fibre feel Fibres used in medical products. We have lost over half of our planet's tropical forests. This year we will lose another 10.3 million hectares of forest. At the current rate, households alone will generate an estimated 3 million tons of waste by 2030, in 2005 this figure was 'just' 1.5 million tons (OECD). Renewable, sustainable resource. No deforestation in harvesting. Fastest growing plant family (about 10 centimetres a day). Soil protective (roots remain in place). No pesticides/herbicides/fertilizer used Nitrogen-fixing agriculture. Absorbs greenhouse gases (high O2 output).